Crew need a pay rise. We need to Get Real on Rates. In local TV drama and film, crew have been campaigning on the issues of stagnating rates for years. The stagnation was recently confirmed by producers’ research into what they had been paying. Getting real on rates means that crew’s real rates are recognised in enforceable agreements with cost-of-living pay increases. To win, we need a majority in the union on a majority of jobs, so we are in a position to put real pressure on producers to Get Real on Rates. So far we’ve built to majority union membership on 13 productions over the last couple of years. Have a chat with your colleagues today about joining to support Get Real on Rates. To win real rates we need a majority to be committed to the campaign as union members and be prepared to stand together to win pay increases. 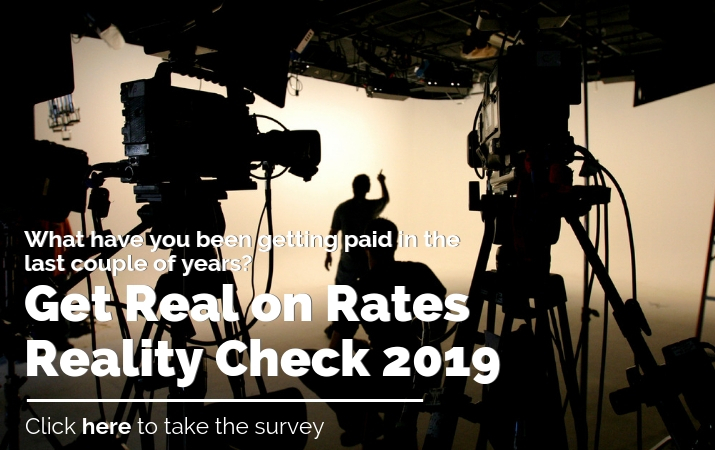 We are collecting rates data to show what producers have really been paying over the last three years for TV drama, local film, and offshore TV drama. You can do it online or send rates through to kelly.wood@meaa.org. A union membership majority is key to winning real rates. Now is the time to join, stand together, and let producers know we are serious about changing the industry for the better. Fees are based on your estimated yearly income from the industry. When this changes, you can just call us to change the level. See the full fee structure here. Share GetRealOnRates.org.au with a colleague. The Get Real on Rates committee has asked SPA to produce a new rates proposal based on real rates. The committee has also indicated that, while it’s possible to discuss some adjustments to the MPPA, crew will not agree to significant cuts to conditions that would represent a pay cut. Crew need a pay rise, not a pay cut. Because it’s likely that there will be further discussions on rates, we are still collecting rates data. What have you been paid on TV drama and film over the last three years? • Win annual cost of living increases to stop the stagnation of crew rates. Over the past three years, crew have been campaigning for the industry to Get Real on Rates. More than 500 crew took selfies that were presented at a negotiating meeting with producers. Crew on productions across the country stood together in a National Day of Action to send a message that they were serious about change and would not give up on the issue (check out the photo gallery from the day). Over the last year crew have focused on building union strength to push the campaign forward. Thirteen productions have achieved a union majority crew so far. Negotiations with producers, through Screen Producers Australia, have re-started with a new proposal from producers on rates coupled with proposed cuts to conditions. There is still a lot of work to do to resolve the issue of pay rises for crew, but MEAA members are determined to win change. We are all in this industry together and we all want the same outcomes; a vibrant and sustainable Australian film and TV industry that respects the professionals who work so hard to make it a success. Australia’s thriving screen industry is globally recognised for its excellence and employs thousands of professionals and businesses. The latest reports* estimate the Australian screen industry contributes $5.8 billion to the Australian economy and employs an estimated 46,600 people. These reports have also shown an increase in locally made film and TV production in Australia. Australian screen crews have a well-earned reputation as among the best in the world, for the professionalism of their work and their flexibility to meet the demands of production. But our industry cannot continue to thrive unless we value the people in it. For years, crew rates have stagnated, while cost of living has gone up. Crew struggle to sustain their rates on nearly every job and because of this, many highly skilled people have left the industry. MEAA members across the industry are tired of their rates stagnating and even eroding on major productions. Screen crew are ready to stand collectively and fight for better pay and a more sustainable industry. How can we get real on rates? Through the Get Real on Rates campaign, MEAA seeks to set an enforceable benchmark of market rates. MEAA will advocate for these market rates to be included in the industry standard agreement, the Motion Picture Production Agreement (MPPA), and for rates to be increased annually with cost of living. Market rates would apply to commercially-funded TV drama, comedy series and feature films. How are rates set now? Rates are currently negotiated between crew and individual employers on a case by case basis. The legal minimum falls far short of what professional crew need to be paid to be able to make a living as freelance technicians. This leaves crew members having to negotiate pay multiple times a year, each time balancing the need to earn a sustainable rate with the risk of being undercut and unemployed. This precarious position has resulted in rates stagnating for long periods. The MEAA market rates will be the minimum standard that is paid in the market for a commercially-funded TV drama, comedy series or feature. We have broadly consulted with key industry members including department heads and supervisors, MEAA members, and crew. The MEAA market rates are the product of these extensive consultations. How is your work valued? When market rates are locked in as a new enforceable floor, crew will still be able to negotiate upwards as they do now, but the new minimum rate would reflect the real standard that crew need to be paid to make a living as freelancers. MEAA is lobbying producers to include market rates in the agreement. We need to show them that crew on every job across the country wants change. That means you need to get involved. * Economic contribution of the film and television industry in Australia. Australian Screen Association, February 2015. The draft market rates have been determined after extensive consultation with crew working in the screen industry Australia-wide. The rates on this document represent the minimum benchmark calculated for each role by department. Our aim is to ensure that once these rates are included in the crew agreements, producers will not be able to charge below them, however an individual can negotiate upwards.